I find it rather amusing that whenever my dietary habits come up people often ask in bewilderment, “but what do you eat?” Well my friends, where do I begin? There’s a common misconception that people on a plant based diet and vegans only eat salad. I’ve lost count of the number of times people have offered me a rather poor excuse of a meal salad with lettuce leaves a couple of wedges of tomatoes and some shredded carrots if I’m lucky. The truth is, I’m not a huge fan of lettuce. Especially not in the cool winter months. The last thing I want to be chomping on when the weather cools down is cold leaves. I can tolerate lettuce in the summer months, when the weather is warm, usually mixed or mesclun greens with added baby spinach and arugula and some sort of fruit and homemade dressing. In the winter however, I’m all for warming foods, lots and lots of soups, grain or noodle bowls, healthified pasta dishes, warm grain based salads or roasted vegetable salads like this one right here. Whenever I’m looking for a lighter meal option, I’ll usually roast a few different vegetables and toss them with baby spinach and/or arugula, some dried fruit, roasted seeds and nuts and dress them in the most basic Italian dressing of cold pressed extra virgin olive oil and balsamic vinegar. 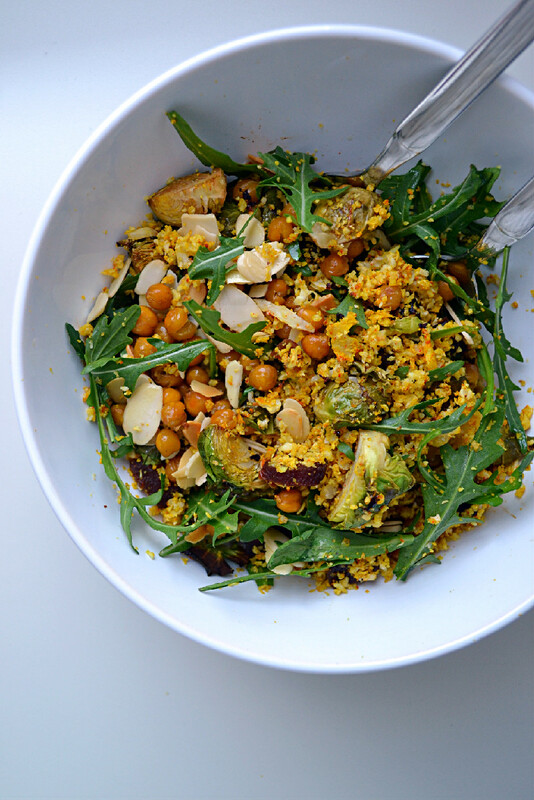 It’s a great way to enjoy salad in the cooler months. 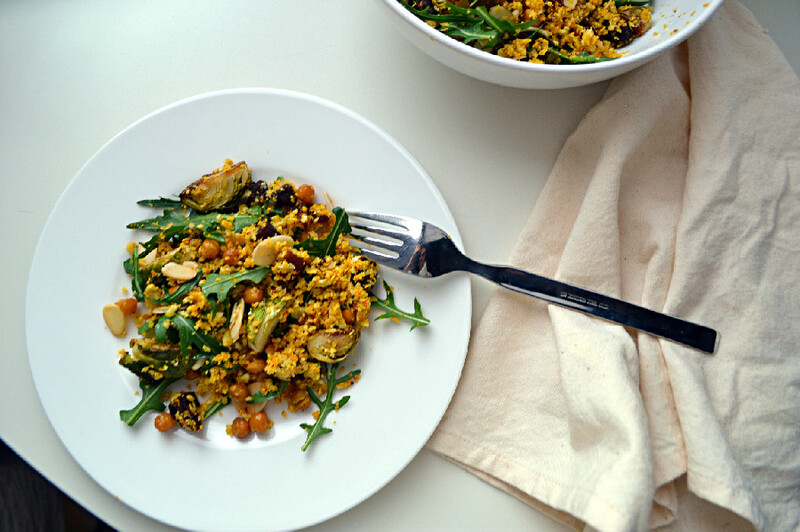 The roasted vegetables, nuts and seeds add warmth and substance to the cold leaves. 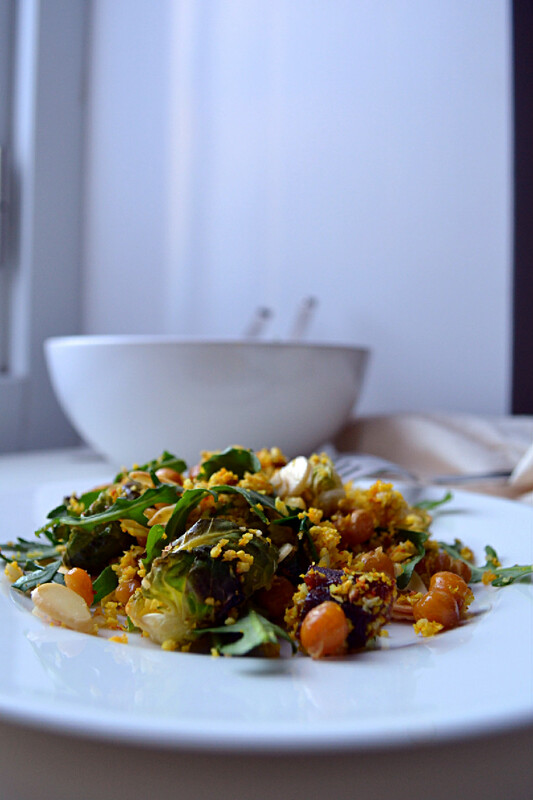 This particular salad is one of my favourite combinations, with a base of spice rubbed roasted cauliflower “couscous”, balsamic roasted brussels sprouts that are caramelized to perfection, dried apricots to add a hint of sweetness, crispy roasted and spiced chickpeas and toasted almond flakes for some added crunch, all tossed with crisp arugula and topped with extra virgin olive oil, balsamic cream and my vegan walnut parm. It’s a meal in a bowl, warming and satisfying all without being heavy. Cauliflower and Brussels sprouts are two of my favourite vegetables, on one condition, they absolutely CAN NOT be mushy and must either have a crunch or be perfectly caramelized. Both cauliflower and brussels sprouts are part of the family of cruciferous vegetables, along with broccoli, kale, cabbage, kohlrabi, collards, mustard greens, turnips, horseradish, watercress and rutabaga. These twelve vegetables are known for their anti carcenogenic properties and their contributions to hearth health. Both cauliflower and brussels sprouts are an excellent source of vitamin C and K, folate, B complex vitamins, and a good source of many other vitamins and minerals not to mention dietary fiber and protein. They both contain anti-inflammatory compounds, called indoles, which stimulate the body’s detoxification system to neutralize carcinogens and prevent inflammation. Preheat oven to 200 C and line three baking sheets with parchment paper. Wash and prep the arugula by removing any long stems beneath the leaves. Pat the leaves dry with a paper towel or clean kitchen towel and set aside. In the meantime, roast the vegetables, and chickpeas, and toast the almonds. Chop the cauliflower into florets, run them through the food processor until they resemble rice or couscous. Do not overprocess or they will turn into mush. Place cauliflower on a parchment paper lined baking sheet and season with fine sea salt, fresh ground black pepper, paprika, and turmeric. Spread out into a single layer and roast in the oven for 15-20 min until slightly browned. Remove from oven and set aside. Wash, clean and quarter the Brussels sprouts. Place them in a single layer on a parchment lined baking sheet and drizzle with balsamic glaze/cream. Roast in the oven until browned, slightly caramelized and outter leaves are crispy, about 20 minutes, being careful not to burn them. Remove from oven and set aside. Rub chickpeas in melted coconut oil, sumac and Herbamare, place on a single layer on a parchment lined baking sheet and roast until crispy, about 25 minutes. About 5 minutes before the chickpeas are ready, sprinkle shaved almonds over top and continue roasting for an additional 5 minutes until the almonds are lightly toasted. Remove from oven and set aside. Alternatively, you could dry toast the almonds in a pan on the stove top. Once all the ingredients are prepped and roasted, toss everything together in a large mixing bowl with extra virgin olive oil, balsamic cream and walnut parm to taste and serve.